As I’m writing you today, a forest fire is burning nearby and has been for about a week. The smoke is in the air. It’s an eery feeling. Here on Vancouver Island, normally a lush rainforest, we are in the midst of quite the drought. Water restrictions, trail restrictions, evacuation plans…changes. It’s an easy time to react, to stress, to live in a seemingly perpetual state of on-edgeness. And it seems perfect timing for unpacking the emotion of fear. As a long-time rider, I’ve gone through phases, periods of almost fearlessness (not so safe) fluctuating into periods of almost paralyzing fear and back to states of ease and flow. Thankfully, my obsession with horses shows no sign of fading and keeps me in the saddle, despite many falls and scary experiences. 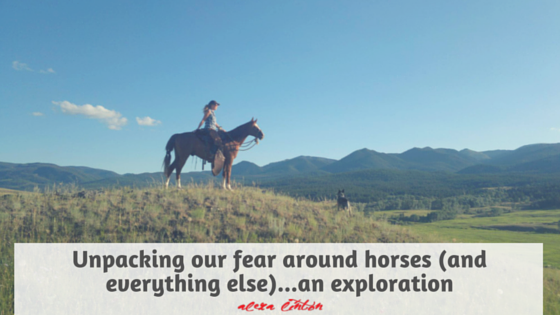 The truth is, the chances of something unnerving happening when you spend time with horses is astoundingly high. They are, after all, when we get down to brass tacks, 1000lb plus prey animals. I’ve seen many leave the world of horses forever after a dangerous incident or a series of experiences left them feeling everything from trepidatious to terrified of horses and riding.